RC pusher jets are usually delta wing style planes driven by "pusher props" located at the rear of the aircraft. They're capable of extreme speeds and some amazing maneuvers. 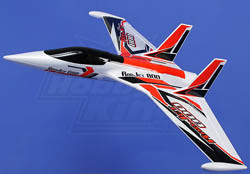 Most pusher RC jets are electric powered and constructed of foam. However, there are some balsa constructed pushers that utilize glow engine. This pages focuses on some of the more popular electric powered pushers on the market. I recently picked up the new F27Q Stryker and I can't get enough of it! The infamous 'ParkZone Stryker' is a classic electric powered pusher jet that just keeps getting better and better! The addition of dual rudder control in the latest version, the Parkzone F-27Q Stryker, allows this flying wing to do some really amazing maneuvers that were simply not possible with previous versions. I'm talking flat spins, knife edges, unbelievable snaps, and absolute crazy maneuvering! The Multiplex Funjet is another classic pusher jet that has been modded and pushed to the extreme by fellow speed addicts over the years. The latest rendition is the FunJet Ultra which has a stiffer airframe that the original Funjet. It's constructed from high density elapor foam which supposedly can withstand speeds of up to 125mph. Most of the speed fanatics that crave high-G maneuvers will beef up the airframe with a fiberglass coating of some sort. Unlike the ParkZone Stryker, both the original Funjet and Funjet Ultra are only available as kits or ARF'S. So when it comes time for sizing the motor it's entirely up to you to determine just how much power she can handle. Push the airframe to the limit... and hopefully not beyond! What makes the E-Flite Carbon-Z Scimitar completely different than any other pusher jet is the fact that it incorporates thrust vectoring for yaw control. This means the propeller and motor actually piviot with the rudder allowing this beast to perform some insane maneuvers. Don't take my word for it, just watch the video to the right! As if it's not already cool enough, the optional landing gear adds icing to the cake. Do you think you have what it takes to handle this machine? Hobby King's Rad Jet 800 is very popular pusher jet that's quite a bit less expensive than E-Flite and Park Zone brands. Don't let the price fool you, this thing can flat out scream! It's constructed from EPO foam and is available as both an ARF(with motor) and as a PNP package where you provide the receiver and battery. A 1300mAh 3S battery pack is recommended to power the 1850Kv brushless motor.Can you image what it can do with a 6S pack? No need to image, check out this insane video to the left where this bird reaches 144 mph! Constructed from EPS plastic, the Radjet 420 Micro RC Pusher Jet is a little brother to the Radjet 800. It is available as a PNP package.